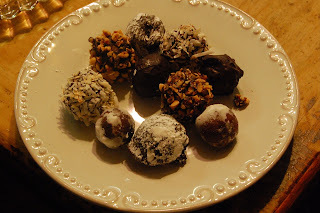 My good friend Cathy made these Simply Sensational Truffles for our dinner party last weekend. They were rich and delicious. They are simple to make and look fabulous. Perfect for all those holiday parties coming up! MELT 8 chocolate squares. Beat cream cheese with mixer until creamy. Blend in melted chocolate. Refrigerate until firm. MELT remaining chocolate. Use fork to dip truffles; return to baking sheet. Decorate, then refrigerate 1 hour. I love how simple these are! They look delicious. What a simple recipe... Lovely and elegant dessert in a pinch.